Mission Bay home sales for the first half of 2018. Image and map data by Google. Additional data by FlexMLS and Warren Redlich. A total of 42 homes sold in Mission Bay in the first half of 2018, including 31 single family homes and 11 townhomes. Only one home sold in Cordova Estates, at the second highest price in the development. 20369 Hacienda Court, with 5 bedrooms and 3 baths in 3,054 square feet, was purchased for $558,000 after five months on the market. 20369 Hacienda Court; image by Google. The price seems low for the size and condition of the house, but the odd location on the corner of a makeshift cul de sac may have made it harder to sell. Two smaller 2500 square foot houses in the Isle sold for $490K and $495K while the lowest prices were $393K and $394K for two bank-owned foreclosures. Sonata also broke the $500K mark with 20270 Monteverdi Circle selling at $529,000 in just 13 days. The 5 bedroom, 3 1/2 bath house has 3000 square feet on two floors. The courtyard home at 20270 Monteverdi Circle sold for $529,000. It has a small pool or guest house facing the street. Image and map data by Google. Not far behind was 10934 Ravel Court at $480,000 with 4 bedrooms in 3000 square feet. There were five other home sales in Sonata, with two of them below $400K. Both of those were due for some updating. Rounding out the north side of Glades, six houses sold in Ventura, three of them between $460K and $465K. All of those were 4 bedrooms with roughly 2300 square feet and they sold quickly. Ventura had another quick sale at $450K, and one buyer got a bargain with 20380 Cozumel Court at only $380,000 with 2500 square feet, remodeling and a new roof. Two attempts to sell via Miami brokers failed and then a Palm Beach broker got it done. The highest price south of Glades was $485,000 for 20940 Avenel Run in Regatta. The house has 4 bedrooms and 3 1/2 baths in 2800 square feet, and it sold in only 5 days. Recent renovation with high end finishes certainly helped. Two houses sold in La Costa, with 20933 La Plata Court going for $450,000 with 4 bedrooms and 3 baths in only 2260 square feet. The seller had done some remodeling, especially in the kitchen, but the bathrooms were dated. It went fast after only 5 days on the market. 20933 La Plata Court; image by Google. Also in La Costa the smaller 20921 La Plata Court sold for $379,000 in less than a month with 3 bedrooms in 1900 square feet. Laguna had five sales. 10694 San Bernardino Way was the top there at $426,000 for a 4-bedroom in 2200 square feet. Right behind it in price, the larger 2900 square foot 5 bedroom at 10668 Santa Laguna Drive went for $123,500. Two houses in Laguna sold very low at $321,000 and $313,500, both 3 bedrooms with 1900 square feet and in need of work. The cheaper one’s listing indicated a mold problem. Harbour Springs had three sales. Two smaller houses with 1900-2000 square feet sold for $375,000 and $376,000, while the larger 2900 square foot 5 bedroom at 11201 Harbour Springs Circle took an even $400,000. The house was on and off the market for over 18 months and sold well below its $489,000 listing price. Reflections saw 8 transactions from $274,000 for a 1600 square foot 2 bedroom on Via Marisa to $325,000 for 10490 Lake Vista Circle (3 bedrooms, 3 baths, 2000 square feet). Three townhomes sold in a tighter range in Las Flores with a 1600 square foot 4-bedroom on Via Jasmine selling for $294,000 and two 1800 square foot models on Via Oleander each selling for $300,000. 2017 was a good year for Mission Bay home sale prices. Mission Bay is another large development west of US-441 with several subdivisions. It includes single family homes and two different townhome subdivisions. Map showing Mission Bay and surroundings. Image and map data by Google. 64 single family homes and 10 townhomes sold in Mission Bay during 2017. The average single family home sold in two months for $427,000 with 2400 square feet at $177 per square foot. The average townhome sold for $284,000 in 20 days with 1600 square feet at $179 per square foot. Mission Bay subdivisions map. Single family subdivisions are in green text; townhomes in blue. Image and map data by Google. In this article the single family homes are covered first, and the townhouses are at the bottom. Prices are up a lot. Just a couple years ago several single family homes in Mission Bay sold for under $300,000 and the top price was $565,000. In 2017 the lowest price was $330,000 and only a few homes sold under $350K. Three homes sold over $600K including the highest at $652K. 20340 Hacienda Court sold for $652,000. Image by Google. Single family homes on the ungated Hacienda Court had the highest prices of homes sold in Mission Bay for 2017. Five houses sold. Three of them were roughly 2600 square foot 4-bedroom houses with prices from $450,000 to $503,000. A 3300 square foot 5-bedrooms old for $630,000. 20340 Hacienda Court was the highest price at $652,000 with 3100 square feet, 5 bedrooms and 3 1/2 baths. The average price in Cordova Estates was $547,000. Most homes sold in less than two months, but one of the smaller ones sat on the market for over seven months. The Isle, which is gated, is sometimes perceived as the most expensive subdivision in Mission Bay. For 2017 four homes sold with an average price of $507,000. Three of them sold in two to three months On Sausalito Drive a 3-bedroom 2 1/2 bath house with 2500 square feet sold for $450,000, and a 2700 square foot 4-bedroom sold for $488,000. On Avenida Santa Ana a 2500 square foot 4-bedroom sold for $475,000. The highest price in The Isle was $615,000 for 10712 Avenida Santa Ana, a 2700 square foot 4-bedroom all one one floor. That house was thoroughly remodeled and has a large lot with great water views from the backyard pool area. It sold fast – only 5 days. Nine homes sold in Ventura on Buena Ventura Drive and Vera Cruz Lane, all priced fairly close together from $405,000 up to $457,000. Eight of the nine were between 2200 and 2600 square feet. 10406 Buena Ventura drive, at 2900 square feet with five bedrooms, sold near the bottom at $406,000. 10274 Buena Ventura Drive actually sold twice during the same year. In January the 2400 square foot 4-bedroom sold for $425,000. It sold again in late November for $457,000 after some remodeling including the addition of a full bathroom. Houses in Ventura took a little longer to sell on average with four of the nine sitting on the market for over 100 days. The average price was $422,000 at $175 per square foot. The average price in Sonata was $414,000, held down a bit by an REO (bank-owned) sold $340K. Other than that one the lowest price was $355,000 for a 2000 square foot 3-bedroom. The high price was $515,000 for 20270 Monteverdi Circle, a 5-bedroom with 3000 square feet on two floors. That price is $40,000 higher than the same house sold for a year earlier. The house had some upgrades in that year. Most of the homes sold in less than a month, but a couple of them took 3-5 months. The gated Regatta subdivision in Mission Bay; image by Google. Regatta was just behind Sonata with an average price of $412,000 for 2017. At the low end was a 1700 square foot 3-bedroom selling at $350,000. Three other homes sold for under $400K, with between 2000 and 2300 square feet. 10682 Wheelhouse Circle squeezes 5 bedrooms and 3 1/2 baths into 2200 square feet. That sold for $373,000. The seven homes in Regatta selling for over $400,000 were all larger than 2400 square feet. 20958 Avenel Run was the highest price at $470,000. It has 5 bedroom and 4 baths in 3100 square feet. Eleven homes sold in Laguna for an average price of $402,000 after a month and a half on the market. Four 3-bedroom houses under 2000 square feet sold for less than $400,000, while six 4-bedroom houses over 2300 square feet sold for prices over $400K. The highest price was $460,000, with two houses each selling for that. 10548 Mendocino Lane has over 3000 square feet, while 20331 Cozumel Court notched the same price with under 2600 square feet. Three houses on La Salinas Circle in La Costa sold in 2017 in a fairly tight price range. A 1900 square foot 3-bedroom sold for $370K, while two 2300 square foot 4 bedrooms sold for $405K and $415K. All three sold in 10 days or less. Rounding out the single family homes in Mission Bay is Harbour Springs. Six homes sold on Harbour Springs Circle and Baybreeze Way with prices from $360K (1900 square foot 3-bedroom) to $412K (2700 square foot 4-bedroom). Also above $400K were two 2900 square foot houses. On average they took over two months to sell, with one home taking well over a year. Townhome prices are up significantly from a couple years ago. In 2015 multiple townhomes sold for under $200K, and the highest price was $286,000. The lowest price for 2017 was $255K, and the top was $315K. The Las Flores townhome subdivision saw three home sales. All three were between 1600 and 1800 square feet, with prices of $276K, $281K and $315K. All three sold in less than a month. Seven townhouses sold in Reflections with two smaller models going for $255K. The top price of $305,000 was a 2-bedroom with nearly 1700 square feet. The average unit sold in just over three weeks. This reports includes homes over 2000 square feet in zip code 33428, plus the northern part of Mission Bay and Loggers’ Run. We covered smaller homes in an earlier report. Zip code 33498 will be up next. Boca Falls saw three transactions since early August. 12387 Clearfalls in Boca Falls sold for $615K in late August; image by Google. The highest price was 12387 Clearfalls Drive in Mystic Bay at $615,000. It’s a 5 bedroom, 3 bath house on one floor. While the location is not particularly special, the house features substantial upgrades including marble floors, a pool and a whole house generator. The listing also had excellent photography. 12265 Rockledge Circle in the Mystic Cove subdivision sold for $577,500. While roughly the same size as the above, it has four bedrooms and substantial waterfront, though no pool. 12806 Hyland Circle in Emerald Isles sold for $535K with 5 bedrooms and 3 baths in 2800 square feet on two floors with no waterfront. 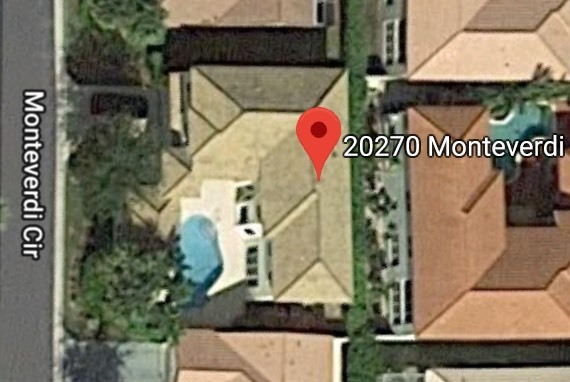 22188 Waterside Drive; image and map data by Google. 22188 Waterside Drive was the biggest transaction in zip code 33428 at $690,000 for 5 bedrooms, 2 and a half baths in 3600 square feet. The location includes waterfront and is a short distance to the middle school, Publix, and Windjammer Park. On the north side of Glades in the gated Island Lakes, 11818 Island Lakes Lane sold for $405K with 4 beds, 2 baths and 2300 square feet. 21799 Little Bear Court in Cimarrron sold for $410K with 3 bedrooms and 2 1/2 baths in 2600 square feet. 21550 Woodchuck sold for $395K; image by Google. 21550 Woodchuck Court, also in Cimarron, sold for $395K with 4 beds and 2 baths in 2200 square feet. 21091 Woodspring Avenue in Country Landing 3 sold for $395 with 4 beds and 2 baths in just over 2000 square feet with substantial upgrades. Two doors over, 21071 Woodspring Avenue sold for a much lower $323K with a very similar size. The listing indicates the house was a short sale that needed “TLC”. 22095 Altona Drive; image by Google. 22095 Altona Drive sold for $435K with 4 beds, 3 baths and just under 2300 square feet. The house was in good shape with some upgrades and has an excellent location with a lake view backed up to the future Fran Reich Preserve. 12490 Baywind Court sold for $435K; image by Google. Also selling for $435K was 12490 Baywind Court with 4 beds and 3 baths in 2200 square feet. Situated on a cul de sac this house has tremendous waterfront and great lake views. This is another listing with great photography including drone shots but unfortunately the interior photos showed off the need for upgrades. Two houses sold for $400K even, both with waterfront. 12658 Maypan Drive has 3 bedrooms and 2 1/2 baths in 2100 square feet. 21943 Palm Grass Drive also had 3 beds and 2 1/2 baths with a floor plan only slightly larger. Landlocked but on a cul de sac, 22146 Candle Court sold for $352,500 with 4 bedrooms and 2 baths in 2000 square feet. 10076 Umberland Place sold for $480K. The house has 5 bedrooms and 3 baths on 2 floors with 3200 square feet. One of the smaller models in Lexington Estates, 22138 Cressmont Place sold for $395K with 3 beds and 2 baths in 2100 square feet. 10781 Santa Laguna Drive sold for $395K with 4 beds, 3 baths and 2300 square feet. It’s on the south side of Glades in 33428. On the north side in 33498, 20508 Sausalito Drive sold for $450K with 3 bedrooms, 2 1/2 baths and 2500 square feet. 20295 Vera Cruz Lane had 4 beds and 2 1/2 baths in 2250 square feet and sold for $432K. 10381 Buena Ventura Drive sold for $417K with 4 beds, 2 1/2 baths and 2500 square feet. There were three promising sales in Boca Woods with higher prices than we are used to seeing. 11044 Boca Woods Lane selling for an unusually high $325K with 3 bedrooms and 2 baths in 2000 square feet. Usually the golf club requirements drag prices down but this home sold well and relatively quickly in under two months. Two others sold for $290K, each after 5 months on the market: 10935 Boca Woods Lane with 3 beds and 2 baths in 3000 square feet, and 10759 Boca Woods Lane with 3 beds and 3 baths in 2400 square feet. It drops from there with 10718 Boca Woods Lane selling for $215K after well over a year on the market. The house has 3 beds and 2 1/2 baths in 2400 square feet. And at the bottom, 10376 Sunset Bend Drive sold for $100K with 2 bedrooms and 2 baths in 2000 square feet. $370,000 – 10266 Brookville Lane, 4 bedrooms, 2 1/2 baths, 2300 sq.ft. $359,500 – 10181 Brookville Lane, 4, 2 1/2, 2700 sq.ft. And 23097 SW 59th Way in Sandalfoot Cove sold for $343K with 4 beds and 2 baths in 2250 square feet. 21351 Falls Ridge Way in The Estates, Boca Falls sold for $721K; image by Google. In Part Two of reviewing sales in May, we look at houses that sold for less than $800K. This is for homes west of the Turnpike (as far north as Atlantic) with over 2000 square feet of living space. Most of these transactions were west of US-441 and south of Clint Moore. 21351 Falls Ridge Way in The Estates sold for $721,000 after four months on the market. The large home has 7 bedrooms, 4 full and 2 half baths in nearly 4600 square feet, and 4 garage spaces. It’s on a corner lot with no lake view. At $158 per square foot it looks like a bargain though the house could use some updating in the bathrooms. 21278 Falls Ridge Way sold for $590K; image by Google. Also in The Estates, 21278 Falls Ridge Way sold for $590K after just 4 days on the market. The 5 bed, 3 bath house has just under 3200 square feet of living space on one floor. The low end for Boca Falls was $473K for 12336 Antille Drive in the Cascades subdivision. The 4 bedroom, 3 bath house has nearly 2800 square feet on two floors, with no waterfront and no pool. $605K – 12341 Riverfalls Court, 5 beds, 3 baths, 3250 sq.ft. $530K – 12372 Cascades Pointe, 4 beds, 3 baths, 2350 sq.ft. $515K – 21395 Gosier Way, 4 beds, 3 baths, 2700 sq.ft. 10885 Bal Harbor Drive sold for $699K; image and map data by Google. 10885 Bal Harbor Drive in Boca Isles South sold for just under $700,000. The 5 bedroom, 4 bath home in 3300 square feet has many upgrades including a circular driveway, gorgeous pool deck and high end kitchen. 19916 Dinner Key Drive sold for $360K with 4 beds and 2 baths in 2300 square feet. The smaller home needs updating and the lot backs up to the road noise from Cain Blvd. 18348 Coral Chase Drive sold for $410K with 4 bedrooms and 2 1/2 baths in 2700 square feet, including a large second floor balcony overlooking the backyard pool and lake view. $350K – 21460 Millbrook Court, 3 beds, 2 1/2 baths, 2700 sq.ft. $390K – 18269 Clear Brook Circle, 4 beds, 3 1/2 baths, 2800 sq.ft. $398K – 18218 104th Terrace, 3 beds, 2 baths, 2200 sq.ft. $439K – 20112 Back Nine Drive, 3 bed, 2 bath, 2100 sq.ft. $465K – 10070 Crosswind Road, 3 bed, 3 bath, 2250 sq.ft. $490K – 10152 Canoe Brook Circle, 3 bed, 3 1/2 bath, 2900 sq.ft. 12737 Tulipwood Circle sold for $510K. The house has 5 bedrooms and 2 1/2 baths in 2900 square feet, including a lake view, small backyard pool, and recent updates to the kitchen and bathrooms. All five Boca Winds homes in this report have water views. $400K – 22225 Collington Drive, 4 bed, 3 bath, 2200 sq.ft. $425K – 21910 Palm Grass Drive, 4 bed, 2 1/2 bath, 2400 sq.ft. $437K – 12332 Cabot Court, 4 bed, 2 1/2 bath, 2300 sq.ft. $495K – 22313 Vista Lago Drive, 4 bed, 3 bath, 2700 sq.ft. 21406 Sweetwater Lane sold for $750K. The renovated 29 year old home has 5 bedrooms, and 4 baths in 4450 square feet, mostly on one floor on a 3/4 acre lot. There is a 550 square foot bonus room on the second floor. $355K – 11661 Timberwood Road, 4 beds, 2 baths, 2050 sq.ft. $380K – 11885 Sunchase Court, 3 beds, 2 1/2 baths, 2100 sq.ft. $535K – 11325 Island Lakes Lane, 4 beds, 3 baths, 2700 sq.ft. $500K – 22364 Waterside Drive, 4 beds, 2 baths, 2900 sq.ft. $441K – 10538 Wheelhouse Circle, 5 beds, 4 baths, 3200 sq.ft. $415K – 10349 Buena Ventura Drive, 4 beds, 2 1/2 baths, 2600 sq.ft. $406K – 10406 Buena Ventura Drive, 5 beds, 2 1/2 baths, 2950 sq.ft. $375K – 20904 Avenel Run, 4 beds, 2 1/2 baths, 2300 sq.ft. $357K – 10831 Haydn Drive, 4 beds, 2 baths, 2000 sq.ft. In Part One we mentioned one Saturnia home that sold for a bargain $800K with 4700 square feet. An even bigger bargain was 11845 Bayfield Drive at $690K with 5 beds, 4 1/2 baths also in 4700 sq.ft. While the listing does not indicate short sale or REO, we do think it was some form of distressed sale. $505K – 19101 Skyridge Circle, 4 beds, 4 baths, 2800 sq.ft. $533K – 11554 Big Sky Court, 5 beds, 3 baths, 3000 sq.ft. $535K – 15807 Menton Bay Court, 6 beds, 4 baths, 3300 sq.ft. $587K – 15766 Menton Bay Court, 5 beds, 3 baths, 2900 sq.ft. $625K – 9765 Napoli Woods Lane, 4 beds, 3 1/2 baths, 3700 sq.ft. $695K – 9539 Barletta Winds Point, 6 beds, 4 baths, 3800 sq.ft. $740K – 16854 Bridge Crossing Circle, 4 beds, 3 baths, 2600 sq.ft. $725K – 8821 Valhalla Drive, 5 beds, 5 1/2 baths, 4600 sq.ft. $715K – 16652 Gateway Bridge Drive, 3 beds, 3 baths, 2600 sq.ft. $669K – 9737 Palma Vista Way, 5 beds, 3 baths, 3400 sq.ft. In the $400K range, 22329 Rushmore Place sold for $485K in Lexington Estates, with 4 bedrooms and 3 baths in 3000 squre feet. At the same $485K, 22486 Martella Avenue in Boca Rio has 4 beds, 3 baths and 2400 sq.ft. In Timbers of Boca, 21131 White Oak Ave sold for $434K with 4 beds and 3 baths in 2100 sq.ft. Moving into the $300K range, two homes sold in Escondido. At $399K, 8769 Escondido Way has 3 beds and 2 baths in 2100 sq.ft., and 21150 Escondido Way with an extra half bath sold for $370K. In Stonebridge, 10562 Harich Lane sold for $352K with 3 beds, 3 baths and 3100 square feet. Three other homes sold in Stonebridge between $260K and $290K. Two homes sold in Boca Woods. 11037 Clover Leaf Circle sold for just $185K with 3 beds and 2 baths in 2000 sq.ft. 11116 Boca Woods Lane sold for $250K with 3 beds, 3 baths, and 2700 sq.ft. 20396 Hacienda sold for $515,000. Built in 1994, the house has 4 bedrooms and 2 1/2 baths in 2500 square feet. It sold in September 2016 after being on the market for just under 3 months. Image by Google. Home prices rose in Mission Bay last year, including houses, townhouses. The average for single family homes broke through the $400,000 level rising to $412K from $390K in 2015. Measured in dollars per square foot the increase was nearly 9% over the previous year. The increase was more dramatic for townhouses (including villas) with the average rising to $271K, up 15% from $235K in 2015, though it was only 8% up when measured in dollars per square foot. As we are seeing with a lot of other neighborhoods, the low end is rising. In 2015 there were six single family transactions at $300K or less. In 2016 there were only two. There was movement on the high end as well but the difference was not as dramatic. Single family home transaction prices ranged from $255K to $565K. The $255K house was an anomaly, with the next transaction at $295K. The four highest prices were all in the gated Isle of Mission Bay subdivision and the top 9 were all on the north side of Glades Road. Townhouse and villa prices went from a low of $232K (2 units) up to a high of $307K. Unlike 2014 and 2015, two units sold for over $300K and no units sold for less than $200K. 10410 Lake Vista in the Reflections subdivision sold for $307,400. The end unit townhome has 2 bedrooms and 2 1/2 baths in 1660 sq.ft. and a gorgeous lake view. The larger but landlocked 10471 Mateo sold for $305K, showing the value of a lake view. 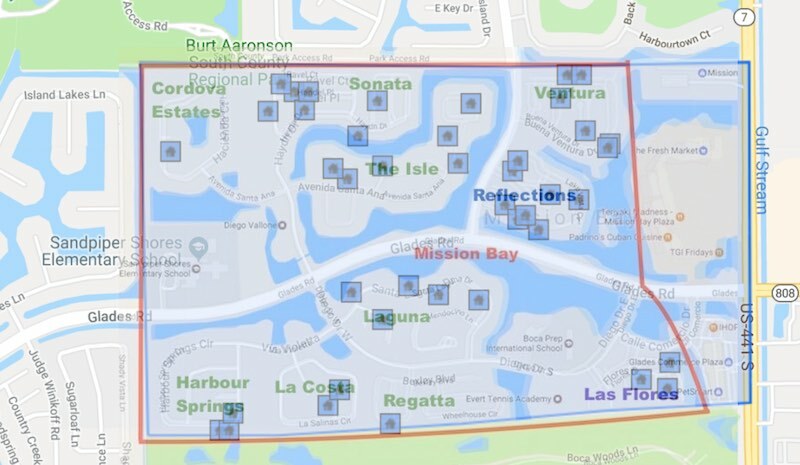 Mission Bay homes are zoned for Sandpiper Shores Elementary, Loggers’ Run Middle, and West Boca High School. The sections north of Glades Road are in zip code 33498, while the southern part is in 33428. There were no REO or short sale transactions in 2016. We excluded those in previous years from our analysis. We looked at condo transactions but there were only a few in the past 3 years and none in 2016, so we left those out as well. Want to buy or sell a home in West Boca? Call Warren at 888-733-5299. The Mission Bay Community has undergone a major transformation throughout its property during the course of 2016. The Board of Governors, staff and volunteers took on this monumental project that began at the clubhouse and continued with most of the major structures within the community. Looking to upgrade their beautiful facilities, they consulted with a designer who helped them create a vision. The Board wanted to create a dramatic effect as you enter the covered walkway to the Clubhouse and accentuate the columns with ledgestone. This added depth and color leading to the pool area. The Club patio was completely redone and redesigned with wood and pavers. New outdoor furniture that include, 2 gas grilled fire pits were purchased in order to give the residents a more enjoyable place to take advantage of the great views of the lake by a fire. The pool patio was enlarged to offer additional seating for its residents. The lounge chairs by the pool were re-strapped to blend with their new color scheme and more umbrellas were added to give the residents more options around the resort style pool. The once screen enclosed game room was revamped and now features an open air bar with flat screen TVs on every wall. The bar was created with a vision to offer residents 21 and older a place to meet and have a few beverages while enjoying the pool and patio. The Mission Bay board began offering Friday evening “Happy Hours” for those 21 and older. In addition Mission Bay offers both family friendly and adult parties throughout the year. They have even implemented “Football Sundays” for residents to enjoy a “sports bar” environment during NFL season! These parties have become very popular events and attendance is usually very high. All of these Country Club amenities are offered to residents without charging country club prices. All Mission Bay monuments have been updated and refurbished. The stonework and color scheme were carried out throughout the whole community including all Directional signs. Their main monuments located on SR7 and Glades Rd. are an important structure of West Boca. Both Mission Bay residents as well as all persons living in neighboring communities enjoy the view of the beautiful building standing on the North side hill. For this reason, it was important to the Board to upgrade and accentuate this structure for the Community. New reverse channel lettering was installed, stone was added to the pillars and the building, and iron gates were placed in the archways. All this in order to highlight the architecture and the pillars. Landscaping was also added to enhance the area. Another major change Mission Bay residents saw this year was in a new Cable Television service. Residents now enjoy both cable and high speed internet service paid through their Mission Bay HOA dues. This now allows everyone to access free internet while at the playground, tennis courts, basketball courts, gym and pool area. In order to keep the community safe at all times, Mission Bay hired a security company to patrol all ten villages and common areas 24 Hrs. a day, seven days a week. This added security ensures that families continue to live in safe place. Beginning in January, the workout facilities will be remodeled and the gym equipment completely replaced with the latest machines available in the market. Once the renovations are complete, the aerobics classes will include new spin classes as well as the current body sculpting, Zumba, Boot Camp and Yoga classes that have always been offered.